Taking holiday photos is fun, whether we're enjoying a month at a luxurious resort on a tropical island or spending a weekend running around a busy European city in the middle of Winter. 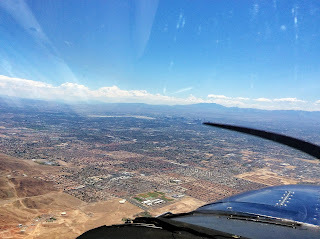 Despite the large volume of pictures I usually come home with, I'm often underwhelmed with the results. What I thought was a beautifully composed night shot turns out to be an array of orange blobs floating in a sea of darkness, and the vibrant colours of the ocean, sky and foliage look lackluster in comparison to my memories. In the past, I've often flicked through the numbered folders on my camera's memory card and discounted the majority of my pictures, simply because they don't impress me at first sight, even though I was convinced they were brilliant at the time I took them. If this sounds familiar, then I hope this tutorial on post-processing will help. I'm not a professional photographer and there will be people out there who can give far better technical explanations of what I'm about to show you, but if you're an amateur like me and you're looking for a simple starting point to really give your holiday pics some personality, then I think you're in the right place. For this tutorial I'm going to use the GIMP photo editing software. It's an open source project which seems to be the go-to, free alternative to professional programs like Photoshop. I've been using GIMP for years and don't think I've even scratched the surface of what the simple vanilla install can do. It'll certainly be able to handle our holiday shots. This is a good example because we all know how this world famous landmark ought to look, with its layered walls of brown and orange rock towering above the Colorado River. The ground, sky and distant people in the shot are also framed in a way which makes the overall picture interesting to look at. This photo was taken using a Canon 1100D DSLR camera and the stock 18-55mm lens that came with it. A DSLR gives you immense control over every aspect of how you take your photos, and for night-time/low light shots I do like to make use of the ability to manually choose aperture, shutter speed and sensitivity. For most daytime shots though, I honestly tend to use the auto or semi-automatic (AV, TV) modes which let the camera decide most of these settings for me. I think the example in this tutorial was taken in full-auto mode and saved directly to JPEG. 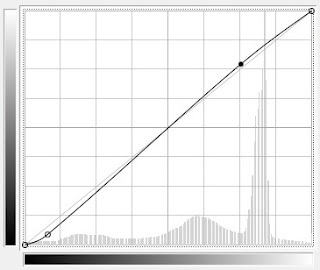 This chart is called the histogram and it appears in a great many places within any photo editing software. We will be seeing it again later in this tutorial too. The histogram is a condensed representation of the entire image and it shows how many pixels across your whole picture fall within certain brightness ranges. If it peaks towards the left side, this means that the image is mostly dark and could be underexposed. A peak towards the right means that there are lots of very bright pixels, possibly telling us that the image is overexposed. 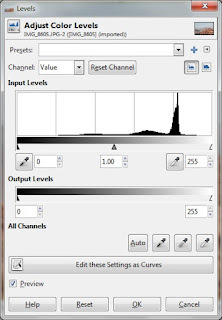 The important slider in the Levels tool is right below the histogram in the area labelled Input Levels. There are 3 little pointers here which, when moved left and right, will drastically change the contrast and overall brightness of the image. You will be able to see these changes in real-time if you have the Preview option checked. The first things to notice here are the gaps at each end of the histogram which tell us that the image contains no pixels which are 'completely dark' or 'completely light'. This often signifies a lack of contrast and is one of the easier problems to fix. 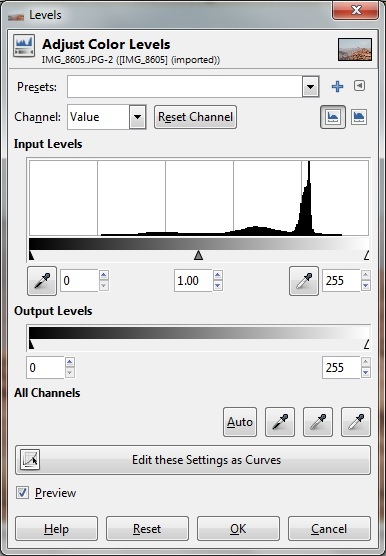 If you drag the pointers on the left and right of the Input Levels slider so that they're closer to the corresponding visible edges of the histogram, you will see an immediate difference in the picture - dark areas will appear darker and vice-versa for bright areas. Press OK to close the dialog and apply the results. Note that the histogram looks different to when we first saw it in the Levels tool - this is because the changes we applied in the previous step have affected the overall distribution of pixels between light and dark. The concept of our new histogram is still the same though - it shows how the brightness of all the pixels in our image stacks up, with those on the left being 'completely dark' and those on the right being 'completely light'. So what does that linear curve across the histogram do? If you click on it, a node will appear which allows you to drag the curve into a new shape. If the Preview box is checked, you should see the image changing too as you drag and drop the node. Can you work out how the curve affects the image? If you pull the curve down, the picture will become darker overall while pulling the curve up will cause it to become brighter. 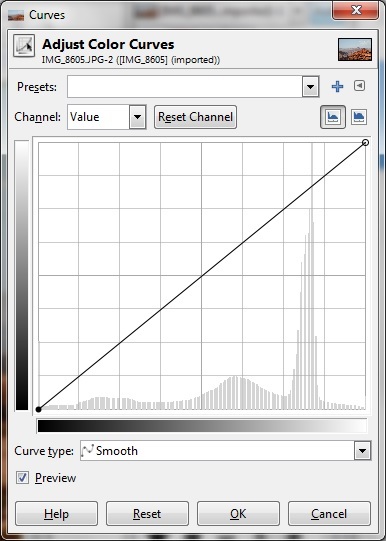 Dragging a certain area of the curve above/below its default linear position will brighten/darken respectively the associated pixel values in the histogram. In practise, this means that dragging the left side of the curve down will darken the shadows, while moving the right side up will lighten the brightest parts of the image. If you click on the curve more than once, a new node will be created at each chosen point. They can all be dragged independently which lets you fine-tune which areas are brightened or darkened. A typical curve which instantly improves many photos is the S-curve, where the left side is pulled down, the middle remains in place and the right side is pulled up. As per the above explanation, this will darken the shadows, leave the mid-tones more or less the same and brighten the lightest areas. This is effectively what we did with the Levels in the previous step, so a full S-curve would probably be overkill here. Up to now, we've been obsessed with histograms and the relationship between bright and dark. If we were shooting in black and white, this would almost be the end of our story but of course we didn't go all the way to the Grand Canyon to not capture the beautiful colours! While our image definitely contains some striking scenery, it still isn't much to look at when you put it beside the cover of a travel magazine showing the equivalent. Our colours look boring and washed-out in comparison and our photo still doesn't give off the warm feel that you'd expect from the Arizona desert. This tool is useful if you feel that your image is incorrectly tinged with a particular colour, for example a photo taken indoors might look too blue or you might notice that someone's skin appears too green due to the lighting or surroundings. 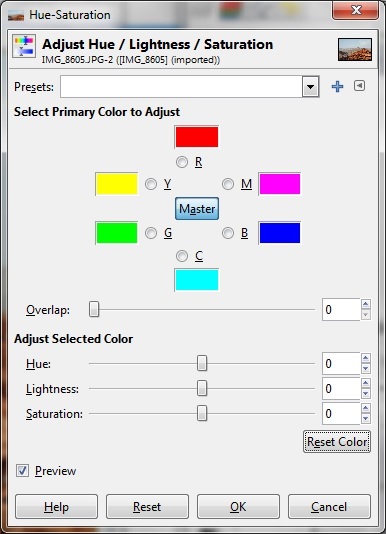 If you do notice a problem like this, simply pull the relevant sliders AWAY from the colour that you want to reduce. 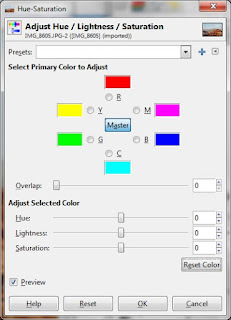 You can mix the sliders to boost or subdue a combination of their primary colours and you can choose whether to modify the shadows, mid-tones or bright parts of the image using the buttons at the top. This tool normally only needs subtle tweaks and I find that I only really need to work with the mid-tones here. I know that's vague for a tutorial but it really is down to your own eye as to what the correct balance is. Press OK to close the dialog and apply the results. To start with, we will play with the bottom Saturation slider. Making sure that the Preview box is checked, try moving the slider to the right and watch how the important colours start to jump out. If you move the slider all the way to the left, the image will be reduced to grayscale. It's easy to overdo saturation, so try gradually pushing the slider to the right until you get a good result. There are quite a few options here, but I find that similar settings can be used for the majority of simple photos. I tend to set the Radius to 2 and play with the Amount until I see a result which is a subtle improvement overall, but doesn't make the more detailed parts of the image look too 'spikey'. 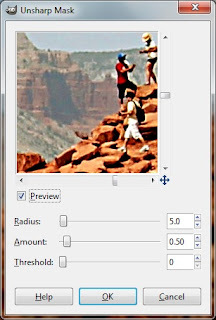 You can use the Preview window to find a point in the photo which contains a boundary or some small details, and then adjust the Amount until you're happy. Start low and ramp it up. Look at that! It puts a new perspective on just how desperately the original needed some attention. It also shows the sort of details that can be teased out of a simple 'point and shoot' photo which took very little effort to compose. Just think what you could do if you had the time to experiment with all the settings on your camera, or even just use a semi-automatic mode which gives you priority control over the shutter or aperture. 1. Adjust the dark/bright Input Levels sliders relative to the histogram edges to improve contrast. 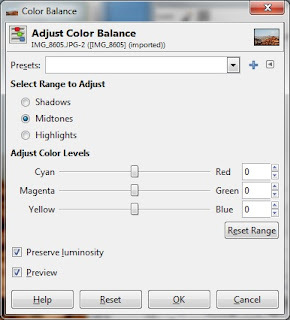 Adjust the mid-tones slider to settle on the overall brightness. 2. Apply a subtle curve adjustment to enhance any areas along the brightness scale we're still not happy with. 3. 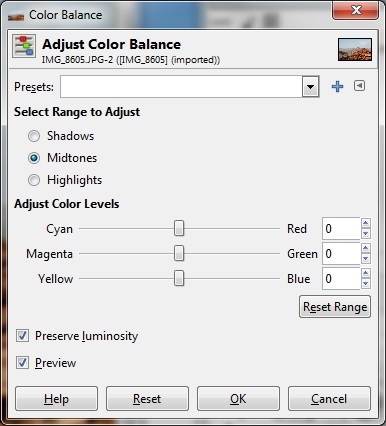 If you think there's a nasty tinge to your image, balance it out using the Colour Balance tool. 4. Increase the master saturation and also adjust the saturation for any other colours you want to emphasise further (or de-emphasise). 5. Apply some sharpening, being careful not to make edges look too 'spikey'.